Q Is goat cheese a reduced fat cheese? A No, it is a whole milk cheese, not a reduced fat cheese. The high moisture content of the fresh cheese makes it lower in calories than a pressed or aged cheese. Q What is the shelf life for goat cheese? A Chevre is a fresh cheese and should be eaten within a couple of weeks for maximum enjoyment and taste. Chevre can be frozen and enjoyed later. Chevre in olive oil will keep slightly longer — the oil tends to preserve it. Aged cheeses will continue to age in the refrigerator and the taste will become sharper and more complex. Feta will keep a long time stored in its brine. Q Does goat cheese need to be refrigerated? A Yes. All cheese should be stored in the refrigerator and brought to room temperature for serving. The olive oil in the marinated cheese will cloud up under refrigeration. A slight zap in the microwave will help warm it up quickly. Q Is animal rennet used in this cheese? A No. We use organic vegetable rennet in the production of all our cheeses. Q Are your cheeses pasteurized? A Any of our cheeses that are aged less than 60 days are from pasteurized milk, as required by state and federal law. All our chevre, camembert, mozzarella, and ricotta are from pasteurized milk. Our aged cheeses are from raw milk, and aged over 60 days. These cheeses include Mainechegoat, feta, and our cow cheeses: Havarti, Gouda, Jack, and Tomme. Q Do you use any artificial hormones in your products? A Absolutely not! We do not use artificial hormones in the management of our goats. If antibiotics are used for the health and safety of our animals, we withhold that milk for four times the recommended withholding period. Q How many goats do you have? A We currently have 60 milkers, a few retired ladies, 1 Nigerian and several mini bucks. We raise mainly Alpines, a breed that originated in the French and Swiss alps. These are a hardy, adaptable animal, noted for their individual personalities and milk which is excellent for cheese-making. Alpines come in a variety of color combinations. We currently have many cross breeds. We only have bottle kids for sale in the spring. Q Are you open at the farm? A Yes! Our farm stand is open weekends from April to December. We also bring the cheese to you, so please come see us at one of our farmers’ market locations. We have many events planned for the upcoming season. In the spirit of reciprocity, cheesemakers from anywhere are invited to drop by. Please call ahead and plan to lend a hand. A Appleton is in the midcoast region, about 15 miles inland from Camden, near Union, Maine. Q How big is your farm? A Appleton Creamery is a small-scale family farm located in Appleton, in scenic midcoast Maine, producing the finest goats milk cheeses. Our farm is small, only five acres, but well-suited to a small herd of goats. Our herd of 60 mixed Alpine dairy goats provides us with milk for cheesemaking from March until December, when we and the goats take a break to prepare for kidding. The goats are fed locally grown hay and a commercial dairy mix, which contributes to a consistent diet, producing a consistent product. Composted manure from the barn contributes to a bountiful organic garden, where we grow many of the herbs used in our cheese, as well as much of our food and lots of treats for the goats. We do not use artificial hormones in the management of our farm animals. 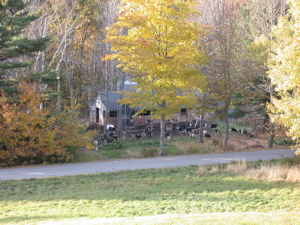 The goats have free-range to about three acres of second growth woods and are never closed up in the barn. Caitlin has been raising goats and making cheese since 1979; Brad married into it in 1988, and without him, the farm wouldn’t function. After making cheese for many years on a home scale, we received state licensing in 1994, and have continued to expand our commercial cheesemaking operation, producing about 6000 pounds of cheese last year. Our daughter Fiona is a Capricorn (what else?) and is a great help around the farm and at Farmers’ Market. In recent years over 100 kids were born, welcoming spring with their antics and boundless energy. Our Great Pyrenees guardian dogs Seamus and Shiitake guard the goats and keep them safe from roaming predators. Our helping circle around the farm includes Cait’s sister Megan Owen, who manages soap production and marketing, and in recent years, apprentices who help with cheese production and farmers markets. We are actively offering three full-time cheesemaking apprenticeships.This is a serious full-season, full-time position, and only the serious need apply. Please check the MOFGA website for a farm description, then email for more details. No phone calls, please.